Seated in the large lobby, soft orchestral music filling the air from unseen speakers, Ilana perused the latest gossip from a quarterly whose pages now rose from the small holoprojector in her right hand. Left knee over right, she waited for the summons from the local constable whose office seemed quite busy this morning. Dolla wasn't on her normal travel itinerary, but this week had seen some interesting developments that the New Republic had an interest in and whether or not it panned out to be anything of note was still yet to be seen. Out of habit, the agent was in disguise even though no one but a small core knew she was a spy. Her early years had taught her a lot of important lessons which had left their mark. Sighing, she was bored with the stories of local politicians promising one thing and never seeing that ambition through, the officer at the desk cleared his throat. "Miss Towry, the sheriff's available now," he motioned to the lone door to his left. Finally, she mused and pushed herself up, dropping the well abused holoprojector on the table and moved to the metal barrier, then heard the buzz which allowed her into the busy, cubicle-filled room. Continuing along the border, she glanced into several offices as she passed until approaching hers and knocked as she walked in. Rising, the uniformed officer grinned pleasantly. "Miss Towry, sorry to keep you waiting," the older blonde motioned to a chair before her desk and sat down again. "Been a busy morning." "So I've heard," Ilana claimed the nearest chair and sat. "Just received word that one of the latest shipments of coaxium was narrowly saved by our Custom's fleet, but the perpetrators got away. We do have the transponder of their ship and Sector Rangers are on the case, so hopefully we'll have this settled soon." Nodding, brown eyes fixed on the captain. "Any leads on a leak of their schedule?" "Working on that as well," she stated, leaning forward on her desk, hands knitted together. "Though I do have one name that may be an alias, or not," she informed, then glanced to one of several forms on her cluttered desk. "Masyr." Green eyes returned to the Republican liaison. "Haven't been able to find anything on them yet, but I have a good investigator on that now." Nodding, Ilana leaned forward a bit. "Maybe I can help with that. As you know, I'm not here to impede your investigation, but the Republic is eager to get this issue settled and I have a lot of experience with piracy. Just point me to your investigator's desk and I may be able to speed this up." "Of course." Rising, she motioned and led Ilana out of her office, then to an equally cluttered cubicle, then introduced her to a tired looking, middle aged man whose desk and walls around his tiny office were cluttered with information and pics. "Edgar, this is Janet Towry, the Republican investigator sent to help us out." Glancing up, the stubbled, weathered face didn't look happy that someone was sent to do his job for him. "Hey," he half-heartedly greeted and went back to his computer. "If you need anything at all, don't hesitate," the captain grinned and left them alone. "Thanks." Ilana moved in and began scouring his intel on the situation, then noted the one piece of information that would at least get her started. Jack wasn't here today to cause trouble. Least not yet in his mind, and he was here to find some of his suppliers for his establishment, Crowley's. Although in truth the name of the bar or club as some called it was an alias of his he used at times. Not that anyone really put two and two together so that was good for him. Walking through the offices he then asked to speak with an investigator. Surely as weird looking as he was certain some might recognize him from the stunt he did to the Republic. But surprisingly at that moment no one did. Sitting down in the next room over from Ilana the clown known as Jack patiently waited. Dressed in a red long sleeved dress shirt and black dress pants with thin red stripes going horizontal over them he then tapped his foot against the floor. Looking around he heard the name that a few of the other officers in the sector were speaking of which was 'Masyr' and it made Jack perk his brow. The name Jack knew as it was one of his suppliers for alcohol and such. Well he was one of them, the other one who's name was "Argon'as" apparently stole his money and ran off without delivering the shipment that Jack had ordered. Prompting him to come here so he could get assistance. Not that Jack probably couldn't do it himself but he just didn't want any law enforcement involved after he took care of the problem. Which would be bloody of course, per Jack's usual tendencies. "That 'Masyr' name sounds quite familiar." Jack said in a whisper out loud. About five minutes later the officer, a middle aged blonde came in and sat across from Jack, "Apologies sir. Busy day. What can we help you with, Mr. Crowley is it? You must be the one who owns the establishment with the name, correct?" "That is correct, officer." Jack said nodding his head then waved her apology, "Oh it's alright. Don't apologize. It's not an emergency." The blonde eyed him curiously and then shook her head. Jack then crossed his right over his left and sat back in his seat. For now he would need to explain the situation at hand to her. In his hand was a holopad detailing shipments and who it was from, who would deliver it and everything logistical. Jack then presented it to her and slid it in her direction. "There are shipments that I have not received and I think one just took my money and ran off. They were supposed to be delivered yesterday and the shipments are always on time. It raises suspicion but the latter one there is a new supplier and new courier so that is why I wonder about it. I just want my shipments and hope nothing bad has happened to them." Jack said explaining the situation that he presented. The blonde officer took a look at the shipments and all before seeing the name that she had discussed with Ilana. Raising her brow she then took the holopad and then stood from her desk and then looked to the room next door to them, "Let me discuss this with one of our other investigators and I'll be right back." "Take your time, officer." Jack nodded politely as she went next door to the room with Ilana and the investigator. Keep holding on when my brain's ticking like a bomb...guess the black thoughts have come they've come to get me! Sweet caring words...unlike nothing I have heard...sing along mockingbird ya don't affect me! Thanks to Drake for this awesomeness! Brown eyes scoured more of the hand written notes scattered around the cubicle, crumpled pieces on the floor around the waste basket as well as several empty cups with stimcaf stains. A thin veil of smoke also hung around the older, tired looking officer and she knew the look. Probably had an ex-wife and kids now out of his life, or at least not directly involved anymore. His job dictated more time chasing bad guys around the block than being home with them instead. She had met many like that, some of them in her own profession in fact. He glanced up at her, then sighed and went back to scouring through pages on his computer and did his best to ignore the woman hovering over him. "Miss Towry," the captain returned. "We may have something here," she informed and showed the small piece of flimsiplast to the investigator as well. "I have a gentleman in my office right now that's also had some issues with a shipment which may be connected." Rising, the older man led Ilana back into the captain's office, with his boss in tow and eyed the strange looking individual seated there, giving him pause. "Edgar Janneson, I'm leading an investigation right now dealing with some pirates and thieves," he began and leaned onto the front of the captain's desk, eyeing the newcomer as Ilana remained near to the doorway, the captain reclaiming her seat. "The captain stated you may be the victim of these same individuals?" As the captain came back and with the investigator in tow he saw Ilana, though didn't recognize her as she stood in the doorway he then briefly turned his head to look. As Edgar stood and leaned onto the captain's desk he then gave a polite nod. When asked if he may be the victim of the same people Jack shook his head yes and then shifted in his seat. He didn't want to admit it but it did seem that way. Again, he could have dealt with it all himself but he didn't want these people in the room with him prying into something that could be Force related. Jack, was among those who could use such a thing. He was a Sith Lord after all. Though they need not know that at this time. "If you are having the same issue and are investigating it then yes." 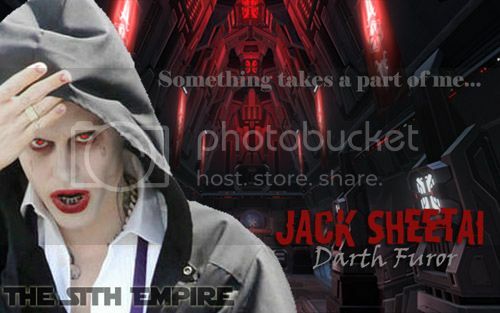 Jack said as he looked towards them all, "I own a popular club, and I hadn't gotten my shipments I'd asked for. Usually, my suppliers are either right on time, or early. Which they receive compensation for early delivery." His red eyes blinked before he stood up. Looking at the datapad once more he then took it and then thumbed through a few things. Once he'd found the info on other shipments that had come before these he then took and showed it to Edgar. Basically giving him a rundown of all the stuff that Jack had ordered that did come in prior. Though he explained that these suppliers were new. It was suggested to him to get alcohol and other assorted things from them because the prices were better, supposedly. The clown let Edgar have the datapad for the time being. "Feel free to take a look through all that, sir." Jack then eyed Ilana and then smirked briefly, "Why hide back there? I don't bite." Edgar listened and took the datapad, running through the list of expected items and nodded. It seemed so far that the shipment may have been the victim of pirates, or perhaps someone that had a bit of bad luck en route to the world. Ilana didn't rule out any possibility as the strange man then eyed her and commented on the apparent lack of trust. Cutting in again, the investigator cleared his throat. "Did you try and contact them? Perhaps they're delayed," he suggested. "Maintenance problems? Things like that." Copying the list, he then handed the datapad back, then crossed his arms. "Trade lanes aren't always the safest, even today. With Dolla being on a minor route, things do come up. Piracy has been reported on occasion between here and Eriadu." Ilana remained quietly observant, knowing that this individual's problems may be on another road and possibly unrelated, though she wasn't about to rule him out just yet. Jack took back his datapad and then looked to the investigator and nodded his head for a moment, "Of course I tried. No response at all, sir. If there were problems I'm sure they'd do they're best to contact me about it. Even if they had to do it the old fashioned way. Guess if I was in their shoes, I'd make sure someone knew what was going on." Noting how trade lanes went he wasn't sure how they operated. Something Jack of course didn't know nor did he really have the time to care. All he wanted was what he paid for and that was that. How it got there or who brought it was what mattered to him. When it got there was also important as he didn't like lateness. That stuff irked him to no end and those who were extremely late paid a price. Usually in some bodily harm or another. Sighing he then tried his best to keep a smile, even if that was hard to do. "Guess I'll try and keep a smile. Kinda hard not to." Jack said making a joke about his own appearance, then looked to Ilana, "What do you think? Guess I'm not familiar with how trade routes work." The Republican spy noted the change in demeanor and how the man held himself, recognizing the darkness that crept up, then faded slightly. He was into things that Ilana tried to avoid, when she could, though had enough experience dealing with the darker side of the galaxy on more than one occasion. This stranger definitely had his fingers in that side of things, she could feel it. The investigator noted the frustration, "Do you have a name? Company name or pilot?" Not wanting the representative to take over his investigation, apparently, he wasn't about to let anything divert the conversation, it seemed. "Ship name? I'm trying to narrow down a huge list of people to hunt down right now, so." Frustration and long nights had been the norm for this officer, Ilana noted.